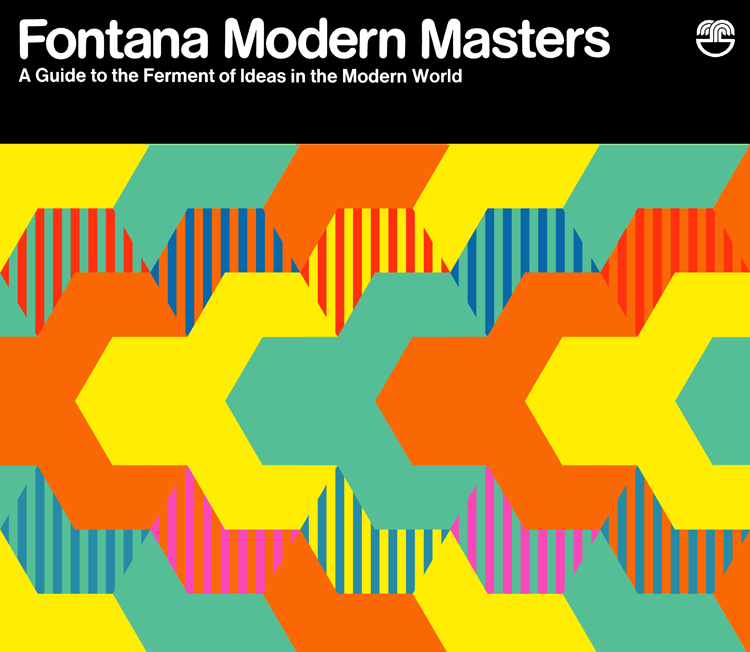 A guide to the ferment of ideas in the modern world. 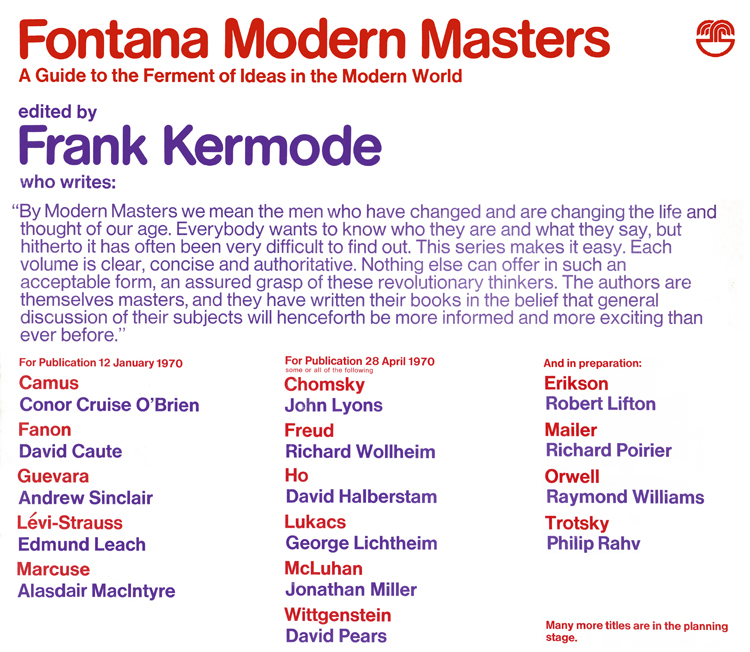 By Modern Masters we mean the men who have changed and are changing the life and thought of our age. Everybody wants to know who they are and what they say, but hitherto it has often been very difficult to find out. This series makes it easy. Each volume is clear, concise and authoritative. Nothing else can offer in such an acceptable form, an assured grasp of these revolutionary thinkers. The authors are themselves masters, and they have written their books in the belief that general discussion of their subjects will henceforth be more informed and more exciting than ever before. If this seemed somewhat over the top then the Times Literary Supplement offered a more balanced view, describing the series as 'just what is needed by the so-called "general reader" in search of a guide to intellectual currents'. This is still true of the books today, though now these monographs on the masters of modern literature, philosophy and science are celebrated not for their contents but their covers, which featured brightly-coloured abstract art and a rounded sans-serif typeface. 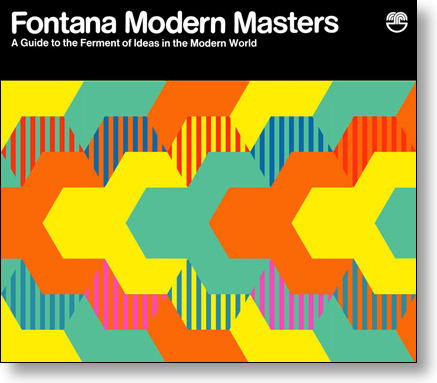 of covers for the first ten Fontana Modern Masters in 1970-71. 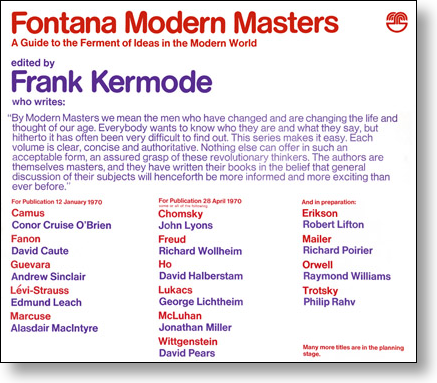 The covers were pocket-sized works of art, and it is as art that the story of the Fontana Modern Masters is presented here, for they did not just catch the eye, they hijacked it. This, then, is a cover story about books, art, and books as art, and the unique place that the Fontana Modern Masters occupy in publishing history. It is the story of a concept, from the 20th-century abstract art that inspired these covers to the 21st-century conceptual art that the covers have inspired in their turn.